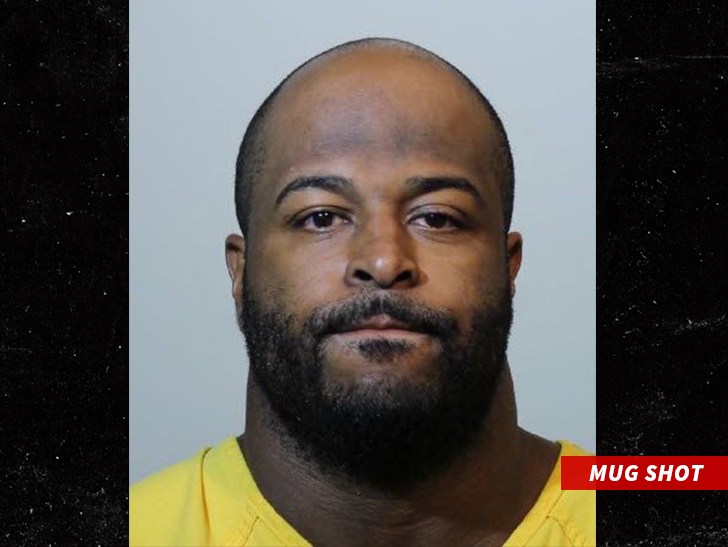 TMZ Sports has obtained video of Barry Cofield‘s DUI arrest … and the scene is intense — with cops drawing their guns and demanding the ex-Giants DL to get out of the car. It all went down last July when the former Super Bowl champion allegedly led cops on a wild police chase after they found him asleep at the wheel of his Cadillac Escalade around 2:40 AM. You can see in the video the conclusion of the chase … where cops are so concerned with the way the 6’4″, 250-pounder was driving — they pulled out their guns and surrounded the car. Cofield eventually opens the door as cops are smashing in the window … and he’s taken to the ground without incident. When cops search the former defensive lineman … they find a wad of cash and a small baggie of what they later say was heroin. Cofield was hit with several severe charges from the altercation, including heroin possession, assaulting an officer, DUI, resisting arrest and fleeing from police. But, Barry was able to get a great deal from prosecutors last week … and after pleading no contest to just heroin possession and DUI causing damage or injury — he likely won’t spend any time behind bars. Cofield was a key piece for the Giants’ D-line from 2006 through 2010 … ultimately helping Eli Manning and NY beat the undefeated Patriots in Super Bowl XLII.